What Sign are You Great Zamboni? This question I am asked often both by toothless hags in the dive bars of the Estonian night, as well as journalists, priests and the occasional cellmate I find myself familiar with while incarcerated. Typically enough I was born during the Vernal Equinox of a leap year at the end of 1894, in a moment spliced directely between December 31st and June 21st, in a strange pocket of time lent to the universe from the Great Spirits and Zues in order to accomocate the strange and tercentennial birth of one such as Zamboni. Because I was split between the summer and the winter solstices (which was necessary for my knowledge of both Hades and the Above-world) I have no normal zoological sign such as Cancer or Tourist. I am actually born quite quixotically under the sign of Platypus. Now before you say, “hey Zamboni, you are three figs short of a hairdo” let me profundicate to you. 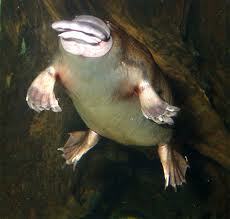 Like Zamboni, the Platypus is very cute and huggable. But, and perhaps you did not know this- the Platypus also has on one of its cute feet a very dangerous and poisonous spur. This is fact! Despite Zamboni’s cutness, I have -through my years in the Estonian Secret Service- a very lethal right thumb with which I have killed a grizzly bear and could do much worse. So there you have it, the sign of Zamboni. And yet, should we really put any truck to all the astrology stuff? Is it not like fortune cookies; whatever they say you can apply it to anyone? Posted on October 18, 2011 October 18, 2011 by ZambonesmanPosted in Debunked Myths, UncategorizedTagged platypus, what sign is the great zamboni?.